"The paradoxes of representation get writ small in landscape imagery: The unframeable framed, a frozen moment betokening time's passage, whereas only shifting shadows can inscribe it. Sean McFarland has this and much else nailed in his one-wall show of minuscule landscapes in Adobe Books Backroom Gallery." 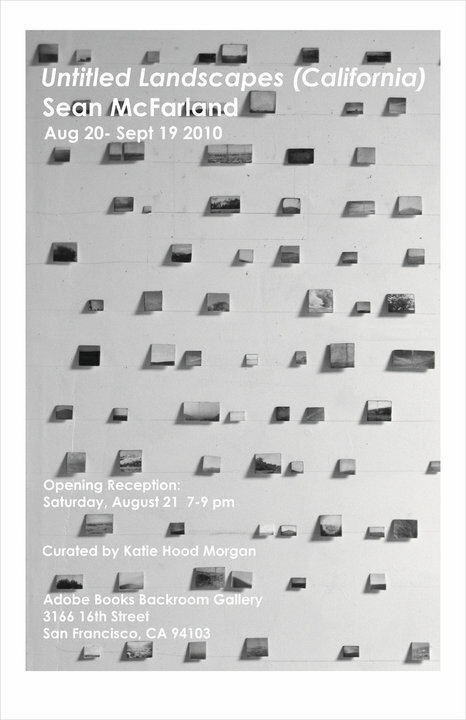 Exhibition dates: August 20 - September 19, 2010. 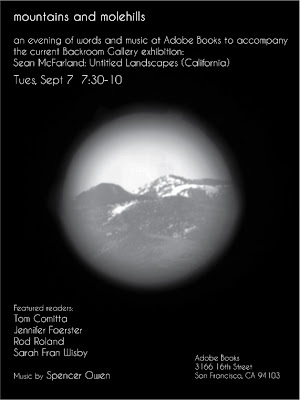 The Adobe Books Backroom Gallery is pleased to present a new installation by artist Sean McFarland. 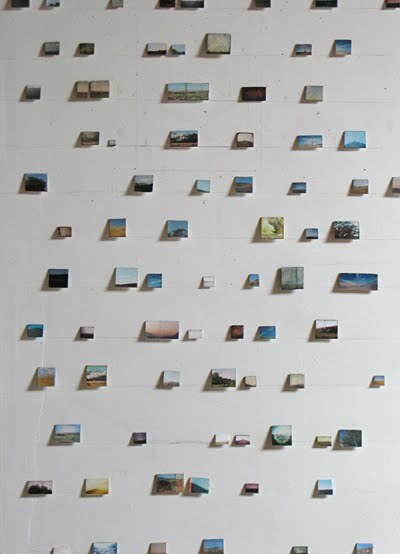 A fourth-generation Californian, McFarland calls up the history of Western landscape painting with a grid of hundreds of miniature landscapes, covering an entire wall of the gallery. Yet the perceived preciousness of these scenes is deceiving. 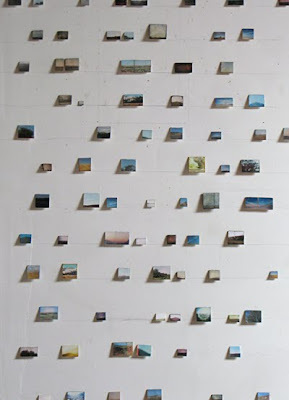 What appear to be hundreds of tiny landscape paintings are actually photographs painstakingly mounted and coated with wax. He has stated that his images of the landscape are, in fact, "pictures of us;" alterations we make to the landscape reflect changes within us. 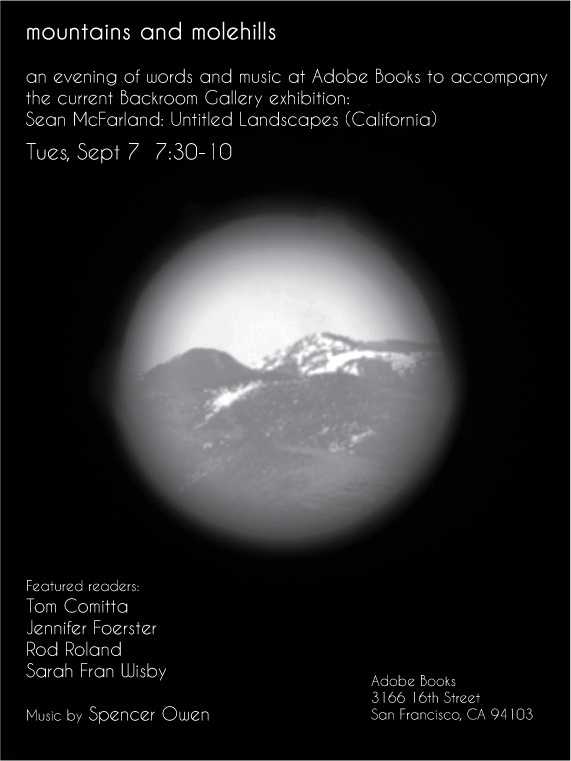 Untitled Landscapes (California) is an investigation into California's unique landscape and an elegiac collection of images that attempt to hold onto wilderness and vanishing open spaces. McFarland's images of roadside landscaping and pocket parks reflect on his desire, though futile, to make beloved souvenirs of these rare places. An artist-made booklet in an edition of 50 will be available for sale at the reception and throughout the run of the show. Stay tuned for upcoming events that will accompany this exhibition. 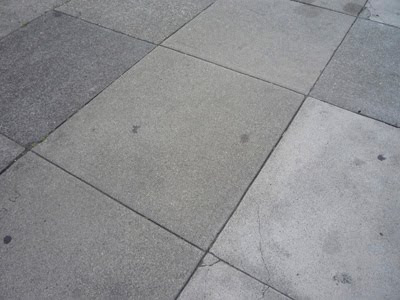 Sean McFarland's work is in the collections of the San Francisco Museum of Modern Art, the Whitney Museum of American Art Library, the Oakland Museum of California, the University of California, Davis, and Humboldt State University. He is the recipient of the 2009 Baum Award for Emerging American Photographers, the 2009 Kala Fellowship from the Kala Institute and the 2009 John Gutmann Fellowship Award. Visit daily-polaroids.blogspot.com. Support for this project is generously provided by Southern Exposure's Alternative Grant Program. Exhibition dates: August 20- September 19, 2010. Kyle Ranson: Portraits exhibition is an Art Practical Pick! Bad at Sports' correspondent, Brian Andrews and Art Practical's editor, Patricia Maloney interview Adobe Books' proprietor, Andrew McKinley and the Backroom Gallery's director and curator, Devon Bella. Listen to the interview on the weekly contemporary art podcast or read the transcript on Art Practical.